garnished with red bell pepper! Wash the peeled zucchinies, lettuce and red bell pepper. Boil the zucchinies until soften. Leave aside to cool. Put the boiled zucchinies in a bowl. Crush with a fork. Place in a strainer. Leave aside. Be sure all the juices went. Meanwhile cut the red bell pepper in 4 slices, brush with oil olive and broil both sides. Let cool. Mix olive oil, salt, garlic, vinegar, mint, black pepper in a small bowl. Combine the sauce and zucchini. Separate lettuce leafs and place on a serving platter. Place the zucchini into the leafs with spoon. 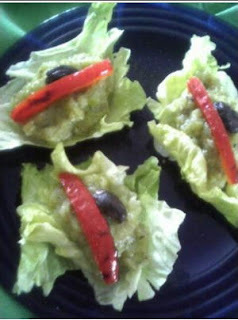 Decorate with sliced red bell pepper and black olive. Tips: You can add finely chopped dill. Anyway, only mint gives a good taste too. 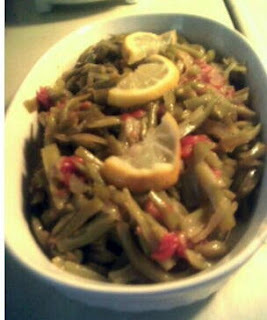 If you like green beans, this vegetanian dishes is for you! You can use any type of green beans, flat or round, short or long..
and if you use flat beans, cut lenghtwise. Put olive oil in a large pot. Add onion and cook till soften. Add the beans, garlic, salt and chopped tomatoes. Pour orange juice and lemon juice. Cook about 20 minutes. Add water and cook 20 minutes more. Let cool, refrigirate and serve cold. salt, extra virgin olive oil. Boil potatoes in the water. Drain and let the potatoes cool till handle them. 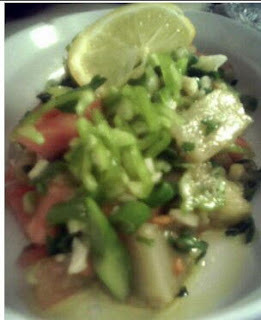 Meanwhile, combine olive oil, lemon juice, mix scallions, parsley, pepper, sumak, salt in a big bowl. 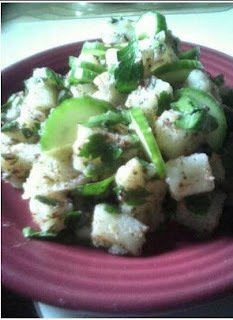 Toss cucumber and cubed potatoes with this sauce. Ready to eat. Tonight I will serve with green beans with olive oil (zeytinyagli fasulye) and grilled chicken. Chocolate is hidden, under the coconut! Mix egg yolks, sugar and milk in a bowl. Combine flour and cocao powder and add to mixure. Cook over medium heat. Stir until thickened. Remove from the heat. Pour in a mixer bowl, add buttery spread(melted),jam and mix 1 minute. Meanwhile, crush cookies and add to the mixture. Sprinkle coconut all over the cookie cake. Cover and refrigerate. a few minutes. 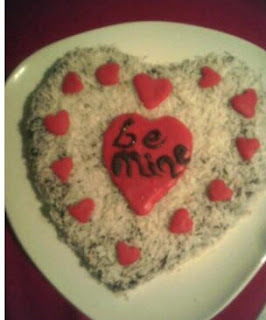 Write your own message on the big hearth shape with brown icing, refrigerate again. Place the hearts on the cookie cake, cover and keep refrigerated. tips; you can also use aluminum foil(folded 3-4 times) shaped hearth and brushed with oil. Low in calories, good source of fiber..
easy to prepare and taste good. I look for firm, heavy eggplants with smooth skin. I'll serve with elbow pasta and grilled chicken today. Wash the eggplant. Prick with a fork. Place on the grill and cook until flesh is soft. Let the eggplant cool. Peel the skin leaving the soft flesh. Slice it and put into the serving dish. Add scallion, parsley, garlic, tomatoes, bell pepper, salt and mix gently. To make the dressing, combine the lemon juice, olive oil, pepper and salt. Drizzle all over the salad and serve. Enjoy..
this colorful recipe is great for you! as much as I enjoyed eating it! 1 tbsp honey and lemon juice. In a bowl, break off the leaves of lettuce and arugula into smaller pieces and toss with carrot. Pour juice of half orange, lemon juice and olive oil all over them and toss. Combine apple and orange slices in the same bowl. Mix them and the same sauce slightly and add to serving plate. Grapefruit or peach cubes may be added to this salad if you prefer more fruits. Add tomatoes(cut in half) and olives. Mix avocado cubes and honey, add on top. 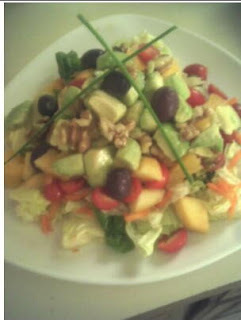 Sprinkle walnuts onto salad. 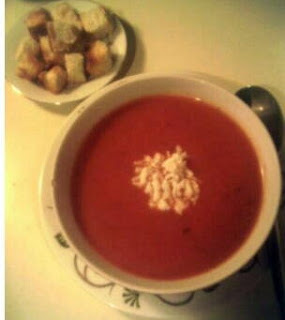 I tried different recipes of tomato soup. Sometimes I put noodle in it instead flour. But this creamy recipe is our favorite. Put chicken broth, tomato puree, paste( mix in a cup of chicken broth before put into the soup) onion, flour in a pot. Cook over medium heat. Continue to stir. Remove the soup from the heat and put through a stranier to smoother the soup. Add salt, spicies and milk. Bring just to a simmer. Garnish with mozerella cheese and serve with roasted bread cubes !